AKRacing Overture Series ▷ Size & Buying Guide on GOTURBACK.UK! The AKRacing Overture Series is an affordable gaming chair series with helpful but no special functions – that makes it possible to offer a lower price compared to other models with more features. You can buy the Overture Series since 2017, so you see that this is one of AKs younger chair inventions. What I like about the Overture Series is the design- it is simple but elegant. I am sure that it would look nice in my home office – but to be honest, I own enough chairs, and I really have to control myself to not buy every chair that looks cool. As I already said, the featureset is very slim. You can only adjust the height of the armrests, no more directions are available. So we have 1D armrests here. The rest is very usual: You will get back- and neck pillows within your package, the maximum weight is 150kg and the backrest is reclinable in an angle from 90-180° to the seat. Of course the Overture Series provides lockable 12° rocking. There are plenty design variants so that everyone will find the colour he likes. You will find some of them in the image above – there are green, yellow, red, orange, blue, grey or black coloured models. These are not even all the available colours. You will find every single available model by following this link to Amazon. That is what I like about AKRacing: Many designs, a lot of accessories. Accessories – you can configure your Overture as you want it. If you order it, you will get with the standard specs. But you can order different types of armrest pads for example in case of you do not like the standard model. There are 3 types of pads: Type 1-3 on Amazon. In case you are a little bit taller than the average gamer you have the possibility to order the extended gas lift which offers 2cm higher sitting. What I can really recommend are the AK Rollerblade Casters. They will make your chair much quieter when you move. That could be helpful if you still live with your parents or family and you want to be as silent as possible at night. You will find them here. If you have clicked through my website already, you will recognise this graphic. And if you have also taken a look at the chairs from AKRacing, you will see that they often accommodate the same audience. The Overture Series is one of these series. It is made for the average build person. So if you are between 1.70m and 1.90m tall, the Overture Series fits your height. Remember that your height should stay in relation to your weight. That means if you are 1.80m tall and weigh 130kg you will not sit comfortably on this chair. You will be happy with the Overture Series if you have a slim or “normal” figure. But if you are overweight, you should have a look at the ProX Series from AK. 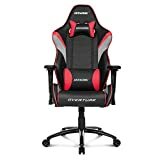 If you are open to other brands, I can recommend the noblechairs EPIC Series, the ICON Series or DXRacers King Series. The chair with the biggest measurements is the Tank Series. I recommend buying your Overture Series on Amazon. I can not deny that I am a real Amazon fan, because I really love the service that they offer. The support always helps you in case of problems with your ordered products and the best for me: Prime. I order my stuff today and get it tomorrow. If you want to test Prime services, get your 30-days-free-trial ▷ here. You can resign it whenever you want to.